Update: Well, so much for that. Refuting earlier rumors that a "secret deal" for Pastor Brunson is in the bag, the US State Department said it isn’t aware of any U.S. deal with Turkey on the release of the American pastor. 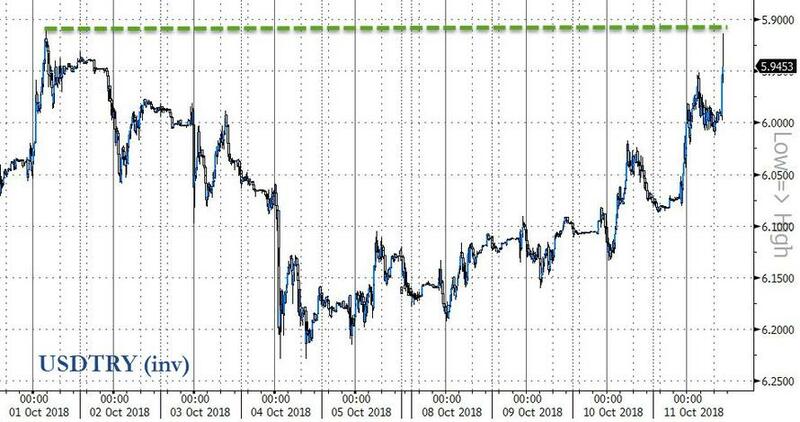 The Turkish Lira spiked to 2-month highs (and faded a little) following headlines that North Carolina pastor Andrew Brunson is expected to be released in coming days after two years of detention in Turkey. NBC News reports that The White House expects North Carolina pastor Andrew Brunson to be released by the Turkish government and returned to the U.S. in coming days, two years after he was detained, according to two senior administration officials and another person briefed on the matter. Under an agreement senior Trump administration officials recently reached with Turkey, Brunson is supposed to be released after certain charges against him are dropped at his next court hearing, currently scheduled for Friday, the senior administration officials and a person briefed on the matter said. The details of the deal are unclear, but those familiar with the discussions said it includes a commitment by the U.S. to ease economic pressure on Turkey. However, the Trump administration, isn't fully confident that Turkey will follow through with the Brunson agreement because Ankara was close to a commitment to release him several months ago but did not, one senior administration official said. "We continue to believe Pastor Brunson is innocent, and the hearing on Friday is another opportunity for the Turkish judicial system to free an American citizen," a third senior administration official said. 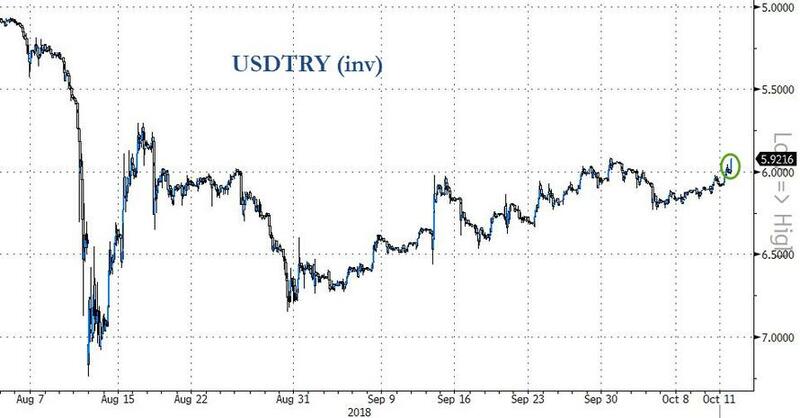 This headline spiked the Lira but even that is fading from two-month high stops (perhaps reflecting the administration's doubts)..
"I must obey whatever the decision the judiciary gives." NBC News notes that The White House does not plan to publicly address Brunson’s release in advance of his court hearing out of concern that doing so would jeopardize it. Officials from both countries have signaled Brunson’s possible release in recent weeks.